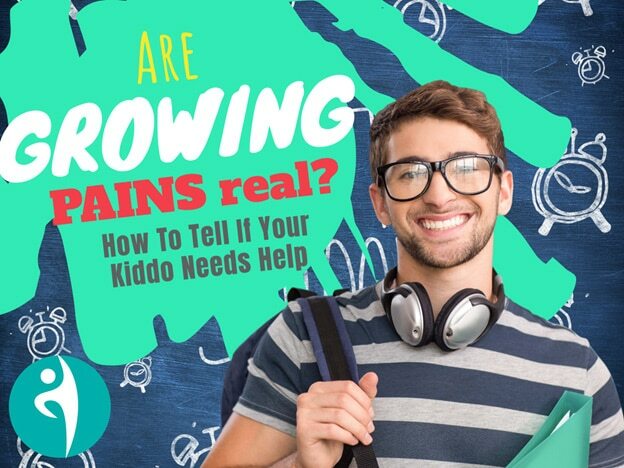 Growing Pains – A Childhood Myth or a Reality? Does he really have a knee problem or does he just want to get out of practice? And if you do take him seriously, where should you take him? His Pediatrician? An orthopedist? His chiropractor? And what are they going to do about it? These are all great questions; questions that doctors seem to be debating as well. There is general disagreement around the cause of “growing pains”, as it does not appear to be connected to growth. There is hesitancy around the diagnosis, and general confusion around best management of this very common childhood condition. I pondered all of these factors myself when my 10 year old started complaining about ankle pain. He had not had a massive growth spurt, was not “flat footed”, and he was not hypermobile, all which are risk factors for growing pains. However, being a doctor, I was able to palpate his heel and figure out where his pain was, and it was right where the big Achilles tendon attaches to the heel bone. Now in kiddo’s, the heel bone does not fully fuse together until they are around 14. So, you have a gigantic tendon attached to a growth plate, as you might imagine this could become a problem area in an athletic kid. So, I did what I do best…started working on him with a combination of soft tissue work, strengthening and chiropractic manipulation to his feet and pelvis. Plus, I literally covered his heel and calf with rock tape. Good news…he felt better! However, literally after his next football practice, his heel was hurting again. So, I taught him how to foam roll his own calves and quads before and after every practice, and this really helped as long as stayed consistent with it. Kids are smart, and they want to run hard without pain. “Growing Pains’ is definitely a poor name for what they are going through but believe me it is a very real and painful condition for kids. I am raising two athletic boys and have had the privilege of working on many young athletes, and I see “growing pains” a lot. Your podiatrist is a great place for a good diagnosis of your child’s issue, but they may not have advice for you besides to wait it out or try different footwear. These are both excellent points, but your child needs good manual therapy (soft tissue work, chiropractic, corrective exercises) to feel better AND advice on how to care for themselves. My kiddo is now almost 14, and guess what, his heel does not hurt anymore. But I treated him a lot, and he learned to look after his own muscles with a foam roller during the 4 years he had pain. His football cleats no longer hurt him and does not have to get his leg hair ripped off with tape, he is a happy camper! The bottom line is get some help for your kiddo, their pain is very real.